Originally published in 1959, MSS SP-58-2018 incorporates the content of the original SP-58, along with the final editions of SP-69, SP-77, SP-89, and SP-90 in order to maintain a single-source document that enables the user to specify a minimum level of acceptance of pipe hangers and support design and performance, in addition to defining the types of hangers and supports. This revised edition includes many new inclusions and updated information. The 2009 edition of SP-58 was originally ANSI-approved and published in 2011. 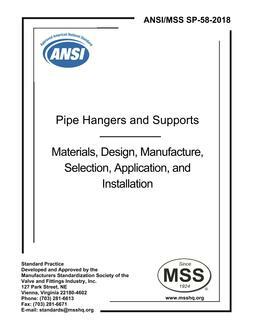 This Standard Practice was developed by a cooperative effort of representatives of pipe hanger manufacturers. 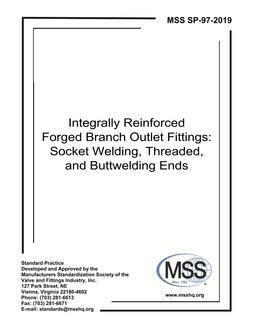 In addition, this Standard Practice was balloted and approved by an ANSI/MSS Consensus Committee (users, suppliers, others) and by ANSI itself as a revised American National Standard. It is based on current "best practice" and on the collective experience of the industry.